Meredith Alwine ’20 lifts 125 kg (275 lbs) during a clean and jerk at the 2017 American Open Finals in Anaheim, California last December. Her success earned her a gold medal at the competition. Just before one of the biggest weightlifting competitions of her life, Meredith Alwine ’20 washed her hands and doused water on her face in the restroom. At the sink next to her was a teenage girl, whose eyes widened when she recognized Alwine. A growing fan base is just one of the things the Randolph junior has had to get used to during her climb to the top of the international female weightlifting world. Although she’s only been competing in the sport for three years, Alwine has already made a name for herself. She first stepped onto the national stage in 2016, when she placed third in the USA Weightlifting National Junior Championships in Philadelphia. She has since gone on to win multiple Junior and Senior National titles as well as three silver medals at the Junior World Weightlifting Championships in Uzbekistan this July. 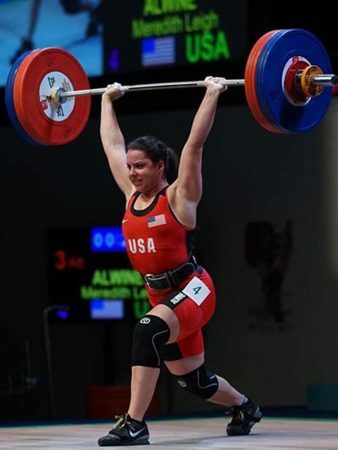 In September, she was one of 1,600 athletes participating in the American Open Series in Las Vegas, where she broke the Junior American record for the clean and jerk lift, as well as the record for the total, and qualified for the Senior World Championships in Turkmenistan this November. Her performance there also significantly improved her chances to qualify for a spot on the 2020 U.S. Olympic team. Weightlifting isn’t the only sport at which Alwine has excelled. She was a competition gymnast until she was 10 years old. Later on, she ran track and played soccer. Just before her senior year of high school, she joined a CrossFit gym and tried her first weightlifting class. As a self-diagnosed perfectionist and fierce competitor, Alwine realized the sport was perfect for her. Alwine is coached remotely by Travis Mash, a world champion powerlifter and owner of Mash Elite Performance in Greensboro, N.C. Her father, Scott Alwine, handles statistics and logistics for her travels. Alwine laughs that her friends often take advantage of her physical strength, recruiting her to help move furniture and always placing their bets on her in arm wrestling matches. However, when it comes to balancing academics with her weightlifting career, Alwine doesn’t joke. Organization is key. Fortunately, she has supportive professors who have worked closely with her to help her manage competitions and coursework. Alwine is a philosophy major and a Dean’s List student who has impressed her professors with both her athletic abilities and her work ethic. “I have enjoyed working with Meredith since our first advising meeting during her first-year orientation,” said Kaija Mortensen, a Randolph philosophy professor and Alwine’s academic advisor. “She was a joy to have in my first-year seminar, and I’ve been continually impressed by her diligent, thoughtful work in her courses, as a tutor, and the way she juggles her high-level academic work with her high-level work in the gym. She has been incredibly involved in shaping her academic experience and proactive in making the schedules work so that neither aspect of her life suffers. Alwine ultimately wants to become a lawyer, and she plans to continue her quest for the Olympics even while in law school and later as a practicing attorney. Despite all of her success and passion for the sport, there are days when Alwine just wants to be a “normal” college student. However, those negative feelings fade once she arrives at her competitions. “When I get to the meet, start lifting, and see my friends and the fans who are cheering me on, all of that motivation comes back,” Alwine said. In fact, the competition community is what Alwine enjoys most about the sport. She has made friends all over the world at various meets—many of whom are her fiercest competitors. 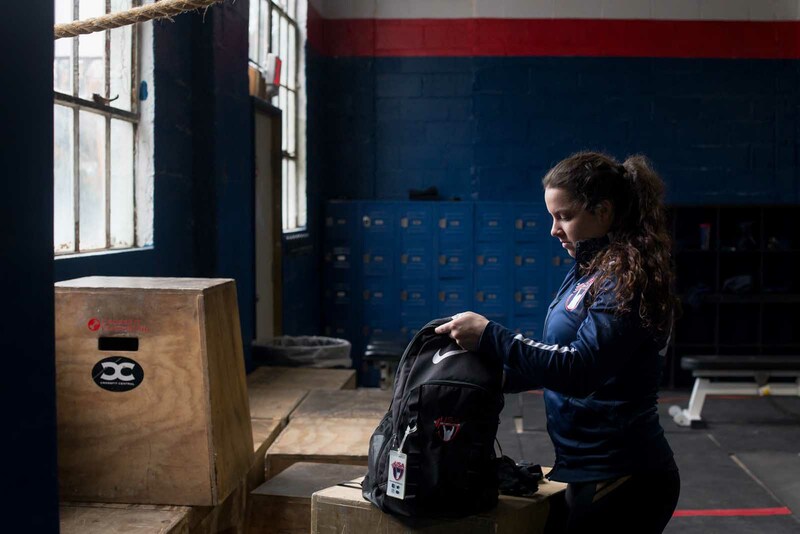 Since she came to Randolph, Alwine has been training at CrossFit Lynchburg, where she’s established even more friendships and a network of her strongest supporters. Owner Jerrod Ruhl, who teaches minor league CrossFit weightlifting, raved about Alwine’s work ethic. 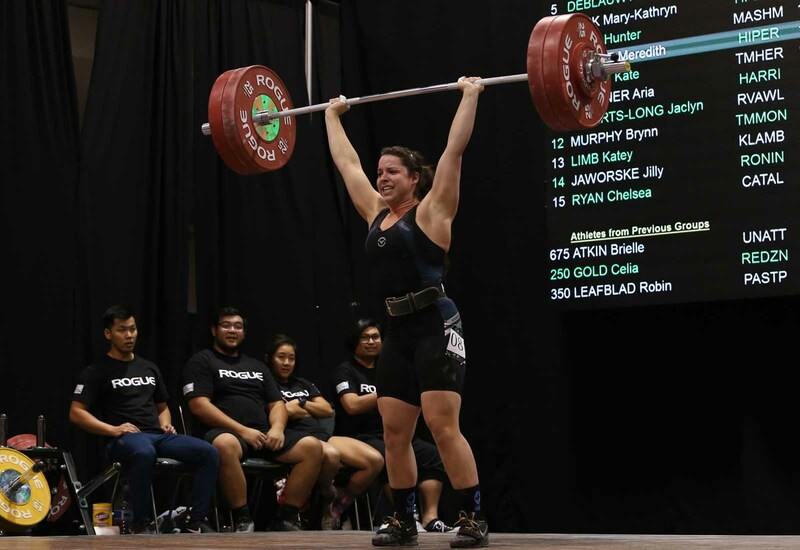 As of October, Alwine had set 15 state records in Virginia and two American weightlifting records. She is also a two-time Junior National champion, American Open champion, and a Junior World silver medalist. And as her list of accolades and personal experiences in the sport continues to grow, so too does her confidence. Alwine at the 2017 Junior World Championship in Tokyo, Japan. However, nothing would make Alwine happier than to represent Team USA in the Tokyo Olympics in 2020. 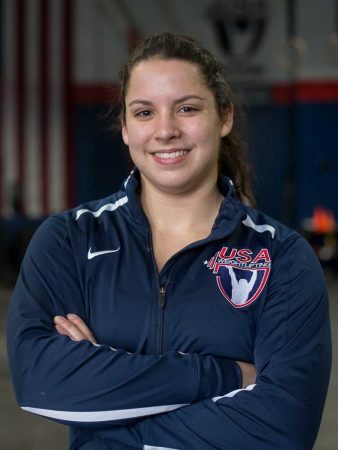 To qualify for one of the four coveted spots on Team USA, she will need to compete in six international events over the next 17 months against the best lifters in the world. She must place near the top of the world rankings in her weight class, and also be considered more likely to win a medal than her teammates in the other nine weight classes. “It may seem like a long shot, but Meredith’s success in local and state competitions, her two Junior National Championship wins, her seventh and second place finishes at Junior World Championships, her Senior National medals, and now selection to her first Senior World team in just three years makes one think that she can accomplish anything in this sport,” said her father, Scott Alwine. Alwine and her father used to kid about her becoming one of the best weightlifters in the world. It’s no longer a joke. “To reach the Olympics in 2020 would be incredible,” Alwine said. “Making the Olympics requires a type of dedication and motivation that lasts through many bad days and bad training sessions and the aches and pains that come with it.